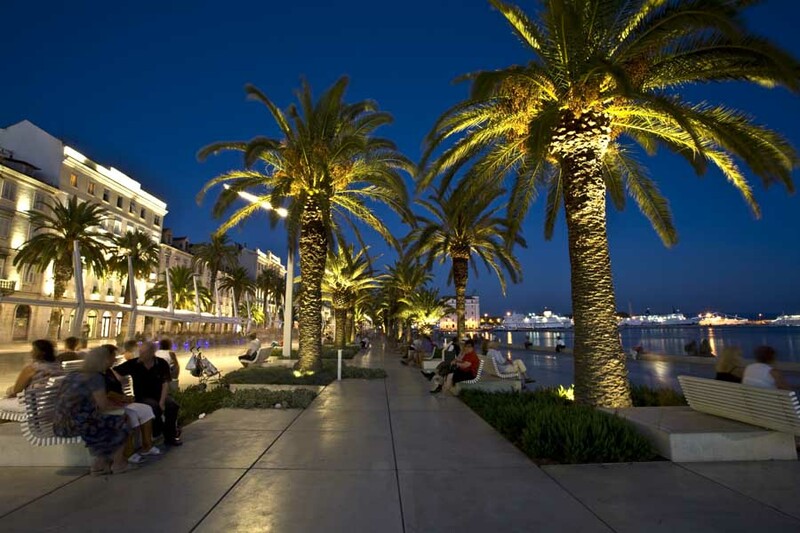 The city of Split, Croatia and its waterfront, the Riva, the embodiment of Splits history and character, are among the most interesting and most remarkable sites in the Mediterranean. 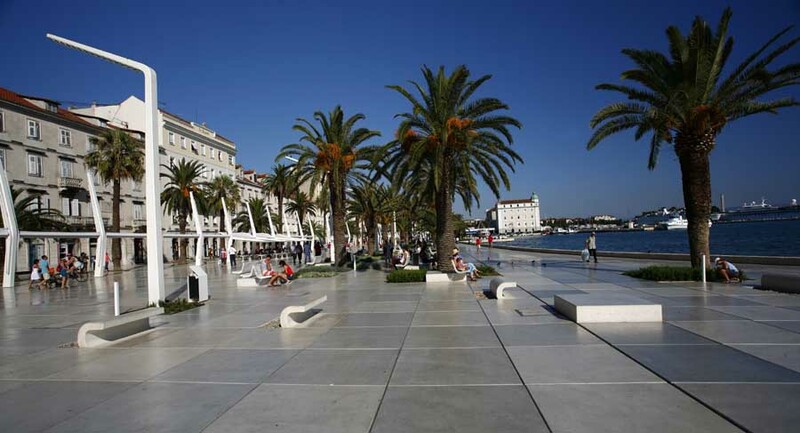 The Split waterfront is an urbanized, open and accessible public space – it is, so to speak, the town’s living room. 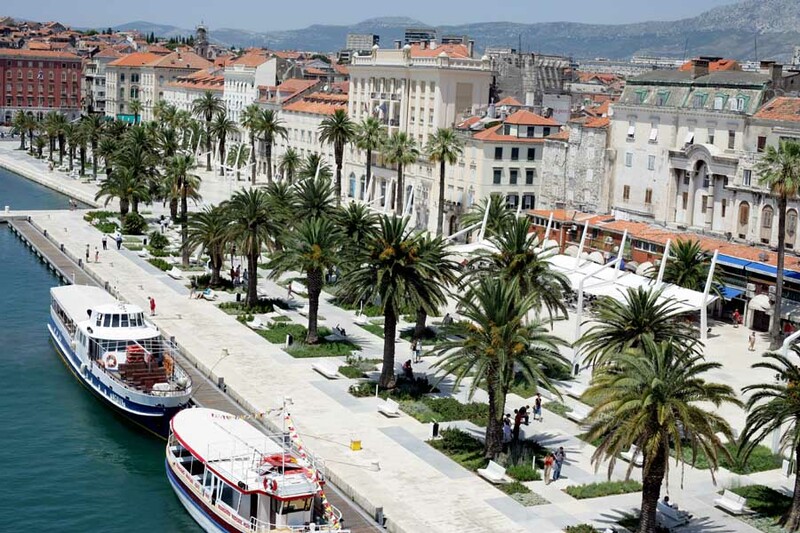 It stands in front of Diocletian’s Palace, the home of the Roman emperor more than 1700 years ago. Over the centuries the palace was transformed from a private residence into a town. In a related fashion its waterfront also underwent numerous transformations of material, form, finish and functional use. 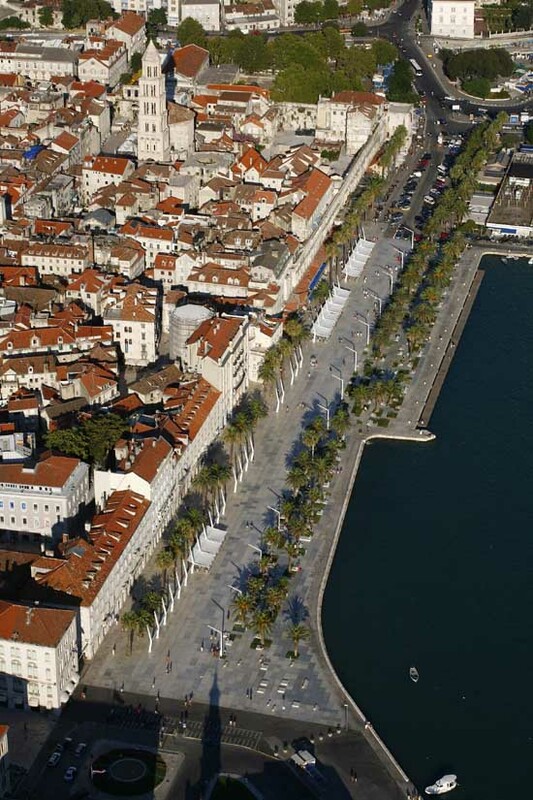 Considering its exceptionally valuable role in the city of Split, the competition guidelines for the waterfront restoration had very precise requirements for respecting cultural and historical heritage, taking particular care of the contact zone between the project area and Diocletian’s Palace, a world heritage site protected by UNESCO. 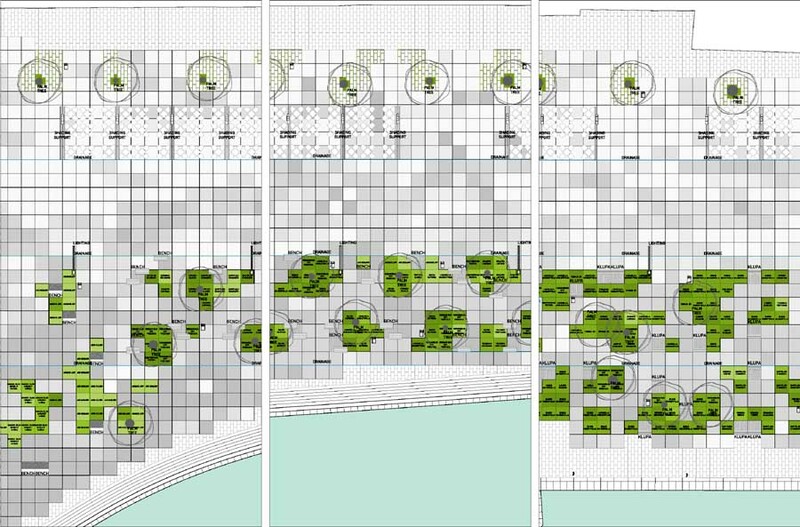 In May 2005, an expert jury awarded the first prize to the design work of 3LHD architects at the public competition. 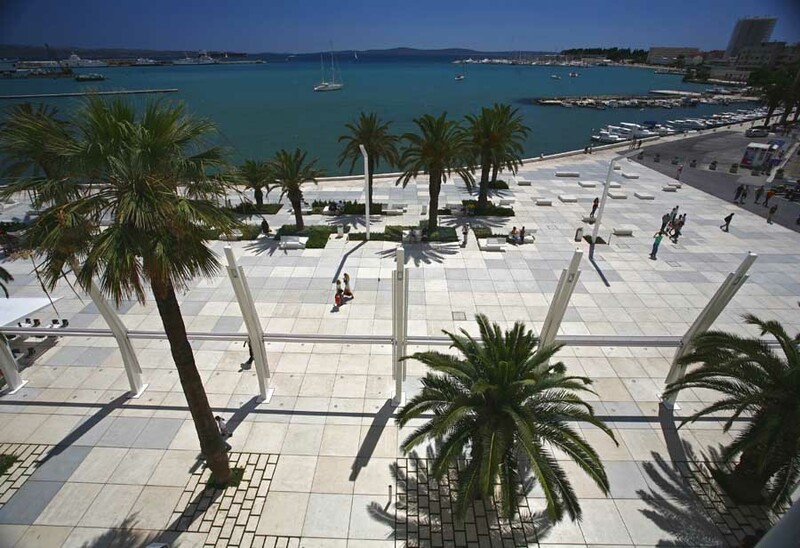 The project was completed by the agreed upon deadline and the Riva was opened on May 7, the Day of the City of Split, by the procession of St Duje, patron saint of Split. The waterfront is a focal point of community activity where the city meets the sea. 250 meters long and 55 meters wide, it is also the main public square, the space for all kinds of social events, promenade by day, parade by night, the site of sport events, religious processions, festivals, celebrations and political rallies. 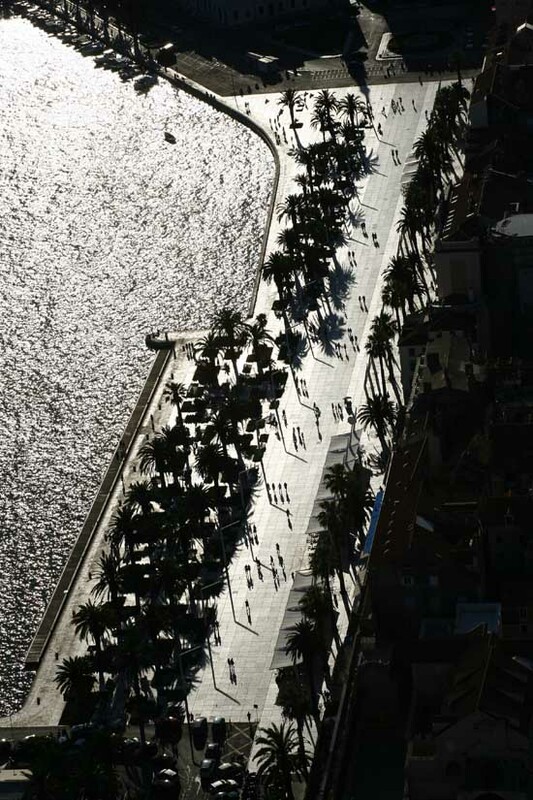 The 3LHD project rearticulates the space for all the events referred to above, harmonizing them on a new integrated surface that adapts to all the usage scenarios while retaining the Mediterranean character of the city’s socio-cultural symbol. The project’s goal was not to simply add a new modern layer atop the earlier structure, but to free the existing surface of everything superfluous, establishing an infrastructure that meets the needs of contemporary life. The project development starting point was a modular network of concrete floor elements 1.5 x 1.5m, the measure of a full stride of two steps in Ancient Rome, so called paces. The color of the concrete varies from white to pale gray and its arrangement and concept is conditioned by the notion that the elements seen from afar should make a pixel image of a rippling sea. 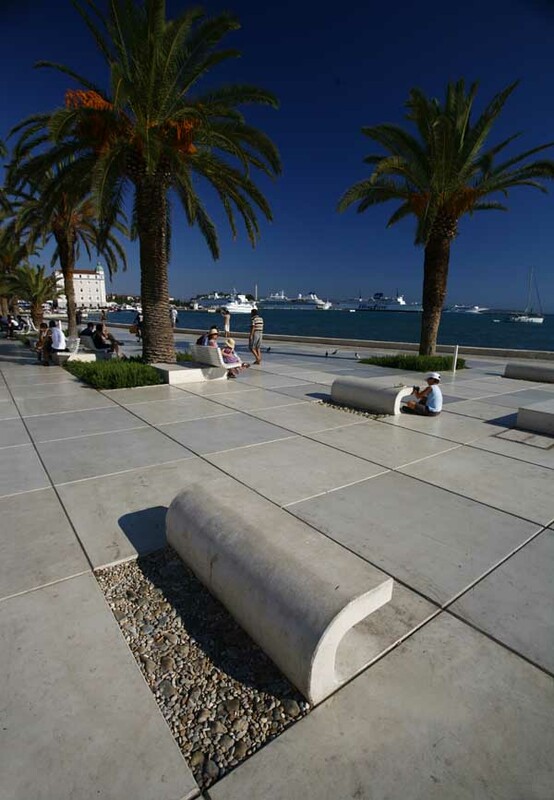 The modular floor covering is the framework for all the current and future purposes and determines the arrangement and the positions of all the other elements of the public space: benches, green areas, outdoor cafés, sunscreens, and structural elements such as manholes, water connections or distances between light sources. 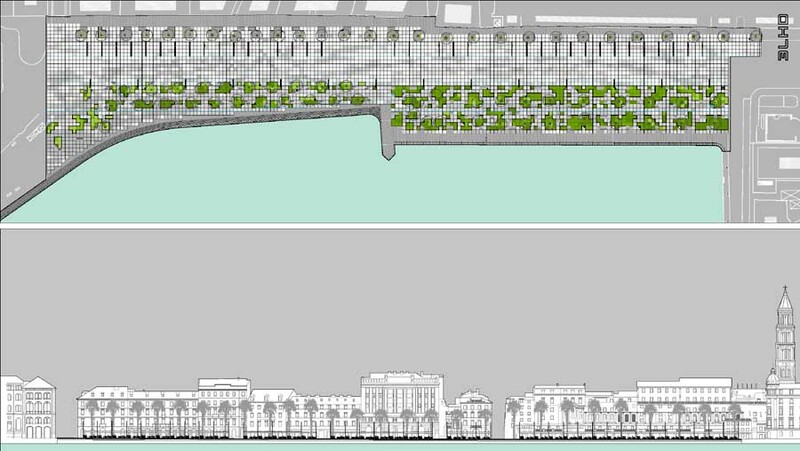 The project amends the detail that over the course of time the functional arrangement of certain spaces of the waterfront was identified, but never architecturally designed. The northern part, along the palace and buildings, always had a row of cafés, restaurants and pastry shops, which were removed from the façade by the renovation project in order to enable free pedestrian movement along the buildings. The outdoor cafés have become an element of spacial design both as a functional part and as a part of the visual identity. 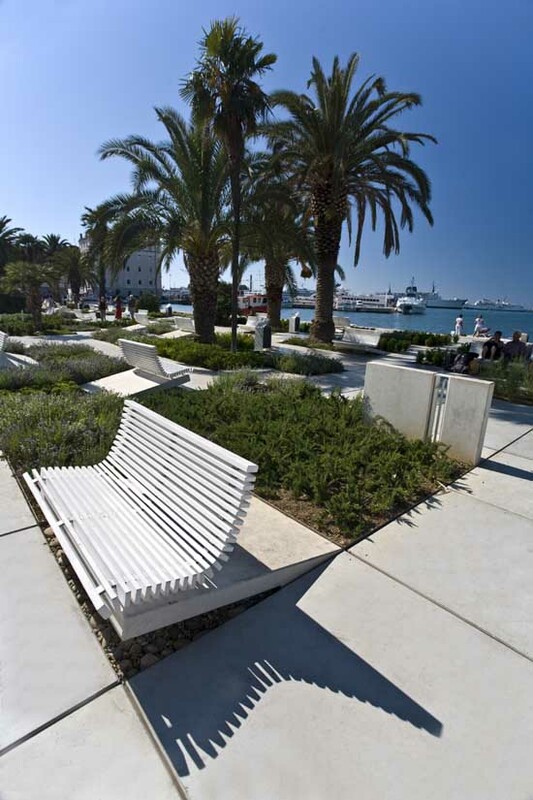 Sunscreens, lights and other equipment, which used to have different shapes, sizes and colors, have become a part of the image of the city from the sea and a unique element adapted to the climate, with the motifs of masts, sailboats, sails and ships. The screens made for the outdoor cafés are useful not only as the protection from sun and wind; the flexible project of this urban element enables its easy opening and closing, of course depending on the weather, making it possible to set the sunscreen/sail vertically, turning it into a projection screen by night. On holidays or during concerts and city festivals, it is possible to have all the elements of the outdoor cafés – tables, chairs and the screen – completely removed to enable the free passage of a large number of people across Riva. One outdoor café consists of an element measuring 6×6 m, which is 16 (4×4) modules. The central promenade is 10.5 m (7 modules) wide and is free of vertical elements over its entire length. It enables the passage of delivery and emergency vehicles. 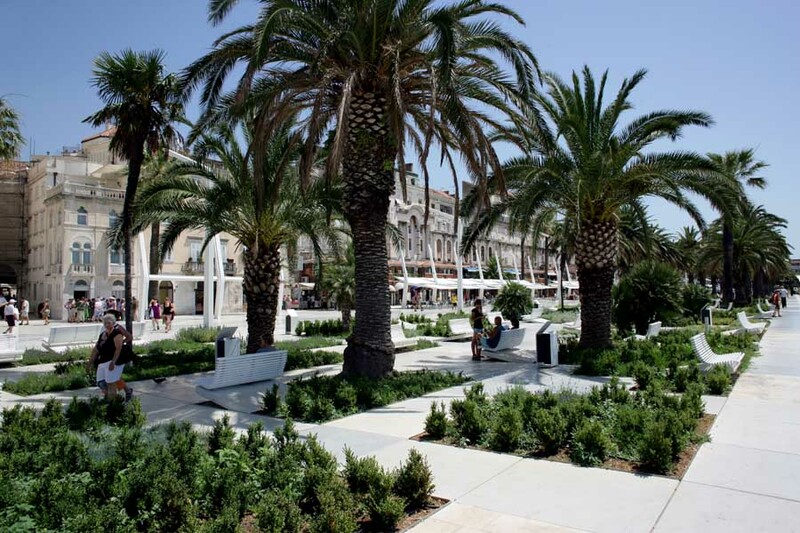 The promenade is defined in space with the outdoor cafés on the north and with light sources, palm trees and a series of three differently shaped parks on the south. A very important design element of the new Riva, are the green elements that introduce the unexpected into the project with their flowering, growth and scents, forging an unbreakable bond with nature. The primarily Mediterranean but also aromatic, medicinal and spice plants include myrtle, oregano, basil, wormwood, thyme, immortelle and lavender. As perhaps a symbolic element, there is also “brnistra”, a species of acanthus, with the Latin name of aspalathos which is said to be the origin of the name of Split. Plants are chosen for their color and height: they are almost always short, not interfering with beautiful seascapes, and with adequate colors that make the gray and green leaves look from afar like the rippled sea, like the colored concrete elements. The plants’ colors vary from a dull whitish-gray to lively silver and green tones; when the plants flower, they get variegated accents, from stony soil to shrubs. All the chosen plants belong to the Mediterranean climate and can stand the conditions on the Riva. They are mostly perennials, immune to salt, thriving in the hot sun and demanding little water. The landscape project was done together with Ines Hrdalo. All urban elements were specially designed for the Riva and reinterpret the celebrated Mediterranean quality of idleness. 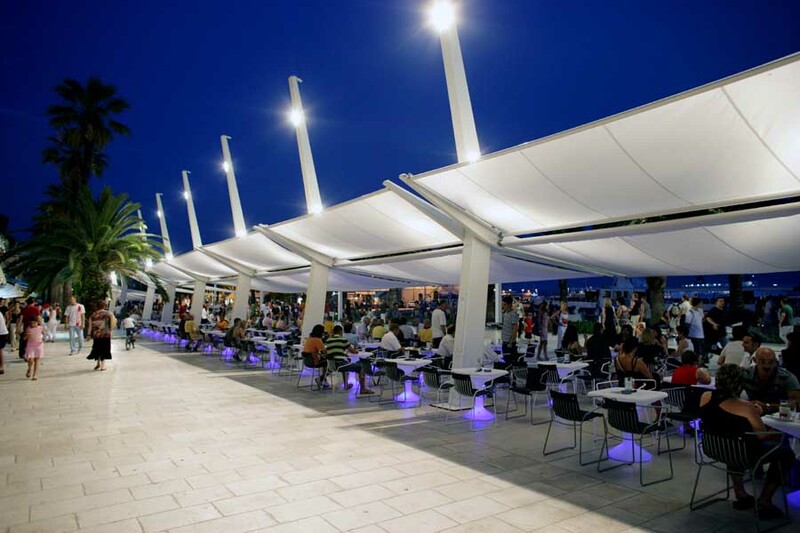 By night Riva becomes an ardent lungomare with the light sources following the particularities of its different areas. 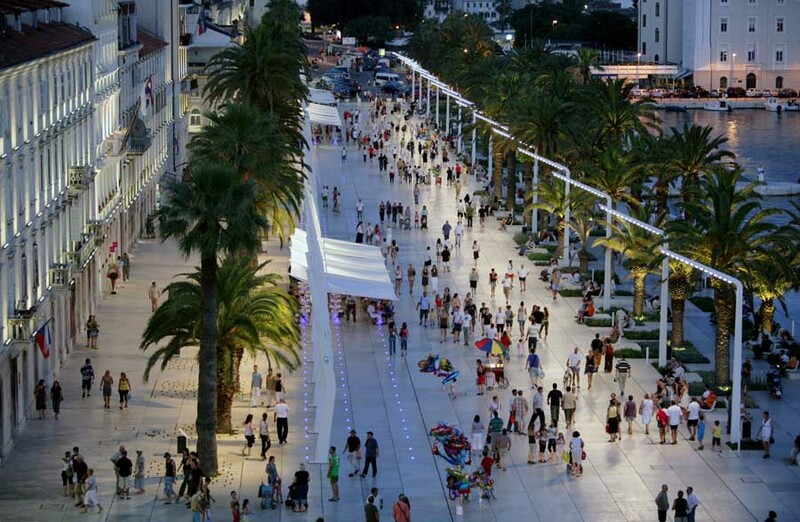 The main promenade includes the basic lighting of the pedestrian zone. Tall lights, arranged in an orderly manner along the promenade, shed a uniformly warm white light on the entire central stretch. This is the first example in the world of the fifth generation of LED technology being applied to city lighting. Similarly tall lights on top of the poles supporting the sunscreens have lamps that light the narrower northern promenade. Urban elements were designed together with Numen – For Use design team and light designers from Novalux. 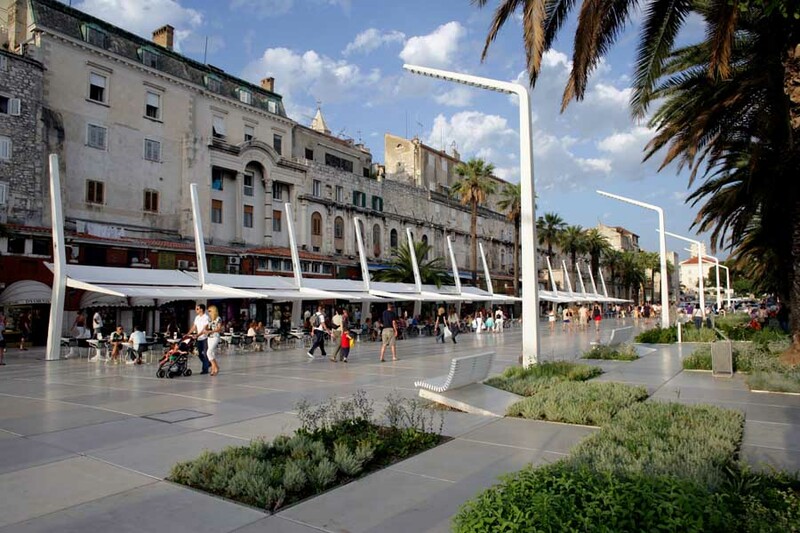 The competition program asked for a solution for the entire area of Riva, covering 24,707 m2; in the end, however, it was decided that the first phase would renovate only the central, purely pedestrian part, covering 14,000 m2. 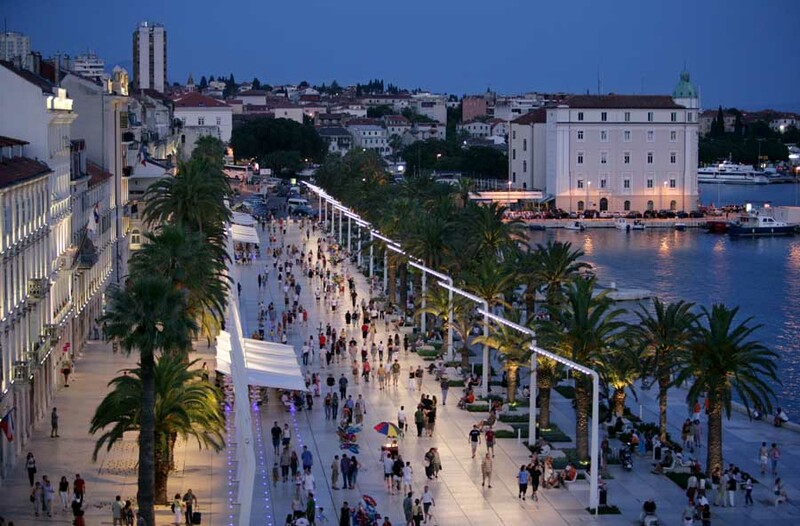 The renovated area of Riva is a strip, some 55 m wide and some 250 m long, with its longer side following an east-westerly course along the coast.